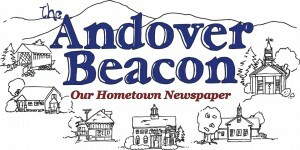 The Beacon is Andover’s paper, and it will only work if everyone in Andover takes an active interest in making it work. let everyone set their own schedule – no commitment required! This formula will work if everyone is willing to do a little bit for the Beacon when their schedule allows. So get involved! There’s plenty to do to make The Andover Beacon a newspaper we can all be proud of. That’s something everyone can do to make the Beacon successful – read it! There’s lots of room in the Beacon for your thoughts…and your thoughts are vitally important to the Beacon. Click here to send a letter to the editor. Click here to send us your reminiscences. If what’s on your mind doesn’t fit any of those categories, click here and send it anyway! We’ll do our best to find a place for it. There’s a lot going on in Andover every day, and if no one speaks up, it won’t appear in the Beacon. If you know of something that’s happening – big or small, happy or sad, important or not so important – let us know! Or if you’ve got a question that theBeacon should try to answer – let us know! Before anything gets written, we need to talk with the people who know the facts. If you’re one of those people, or if you’d enjoy talking with those people, your help in making the Beacon a useful part of the Andover community is vital. The Andover Historical Society has many, many fascinating oral histories on tape. If we can transcribe them, we can run them in the Beacon. The AHS has the transcribing equipment and the tapes. Now we need people to do the transcribing…how about you? If you enjoy writing, or if you think you’d like to learn to write well, the Beacon wants you! You can work independently or as part of a story team. You can bring your current writing skills to bear, or you can look to us to help you build new skills. And, as with all these “jobs,” there’s no commitment required. If you snap it, we’ll try to use it. Capture scenes of life in Andover digitally or in printed photos – each one is worth a thousand words. Everything needs to be proofread for grammar and clarity. It’s not a glamorous task, but you’ll be the first in Andover to see the news. If you don’t mind asking people for money, this is a great way to meet lots of new people. You can start by making sure your friends and neighbors are all supporting the Beacon by becoming members. If you’d like to do more, we would greatly appreciate your help. If you have experience with any graphics programs in the computer, or would like to learn, you could be a big help to the Beacon by designing and laying out ads. We’ll be laying out the entire paper in Adobe InDesign. If you’ve got experience in this area, please let us know! We print the Beacon at Upper Valley Press in Haverhill, NH. If you’ve got experience working with large commercial printers like Upper Valley Press, please let us know! Once the paper comes back from the printer, there are US Postal Service forms to be filled out, some counting to do, some labels to be applied, and so on. We’ll need your help, especially if you’re familiar with USPS Presorted Standard rules. What you see is just the beginning! There’s a lot more we could do for the community on the Beacon’s Web site. If you’ve got Web development experience, particularly in Microsoft FrontPage, or would like to learn, this will be a great project to work on. As with any enterprise, we’ve got accounting books to keep, government forms to fill out, and so on. It’s important that we do it and do it right. If you’d just like to help us keep things organized and not falling through the cracks, you’ll be worth your weight in gold! This is far from a mindless secretarial job … there are plenty of interesting challenges thrown in. We need people to manage key teams of volunteers, especially the research/writing team, the production/distribution team, and the technology team. Join The Beacon Team Today! As you can see, there’s plenty to do to make the Beacon work. And for volunteers, we’re not looking for a commitment – just do what you enjoy, when you can. If everybody offers that much, we’ll have a great community newspaper, for sure! To learn more about any of these jobs, or to ask about anything else that might interest you, contact Charlie Darling at 735-6099.